LAS VEGAS — High technology is taking to the high seas. Cruise ships are being outfitted with sensors and trackers, all to help crew members better anticipate passengers' needs and whims. 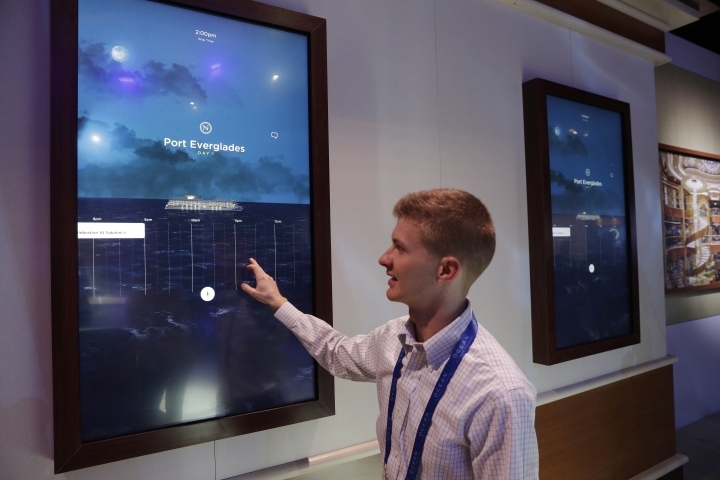 Carnival Corp., the operator of cruise lines including its namesake, Princess, and Holland America, unveiled the new concierge technology at the CES gadget show in Las Vegas on Wednesday. It's scheduled to debut on the Regal Princess cruise ship in November. With it, the door to your cabin will to unlock automatically as you approach wearing your personalized tracking medallion. The wait staff can bring your favorite cocktail before you even ask. This type of personalization is important as cruise ships get bigger and come across as impersonal, says Mike Driscoll, editor-in-chief of Cruise Week, an industry publication. It can also help cruise companies attract more first-timers, including tech-savvy millennials. The leisure-cruise industry is playing catch-up with travel peers like hotels and airlines, which now let you unlock rooms with a smartwatch or fly with a boarding pass on your phone. "It's catching up to what life is like on the land," Driscoll said. The linchpin of the system is a tracking medallion the size of a quarter. Cruise passengers wear it as a pendant, throw it into a purse or place it in a pocket. The medallion uses wireless technologies to communicate with sensors placed around the ship, cruise terminals and even airports, where staff can provide personalized greetings as passengers fly in. Crew members armed with tablets can respond to any needs nearby. For example, a guest could be having a drink when a crew member comes by to remind him that a yoga class starts in five minutes. Or a waiter working poolside can ask whether a guest wants her usual gin and tonic. 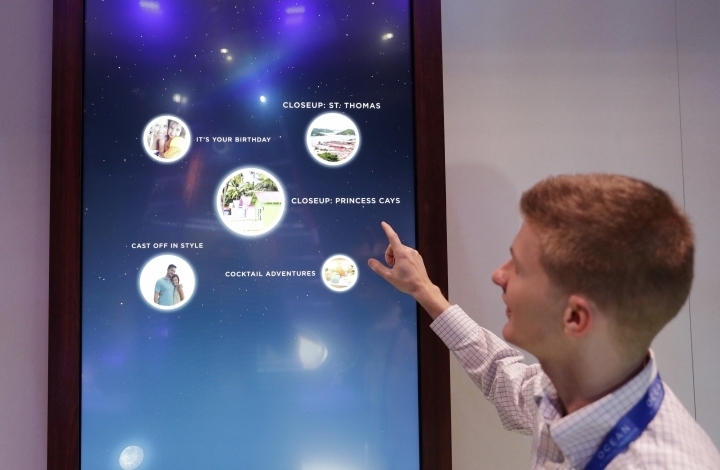 In addition, interactive displays can offer personalized directions to guests' rooms. And the medallion ties into a payment system, so no one has to swipe or sign anything when buying souvenirs or drinks. Whether anticipating guests' needs will feel useful or creepy remains to be seen. Those who might be spooked don't have to use the medallion or can limit how much they want to participate, Carnival CEO Arnold Donald said. "In the end, the guests will tell us," Donald told The Associated Press. "If it doesn't (resonate), it's back to the drawing board." Donald said he hopes the service will encourage customers to sign up for repeat cruises while spending more on incidentals. Different passengers might react quite differently to the service. "With your 83-year-old aunt in Saskatchewan, it might be too much," Driscoll said. But for a passenger in his 50s, it could make life on the ship "just easier." Miami-based Carnival plans to expand the setup to all other Princess ships in the next several years and eventually to other vessels. Carnival, the world's largest leisure travel company, owns more than 100 ships across 10 brands. Personalization isn't new to the travel industry. Walt Disney World in Florida has a MagicBand wristband device that doubles as a room key and "FastPass" reservations to popular rides. The MagicBand is also linked to a credit card for speedier payments at restaurants and gift shops. John Padgett, who was one of the chief architects of the MagicBand before joining Carnival in 2014, said the cruise ship's system goes further in eliminating the need to touch or tap a terminal. Sensors pick up signals automatically. "There are no wires. There is no charging," Padgett said. "It doesn't require a guest or consumer to do anything specific." Carnival officials say there will be safeguards against someone walking away with another guest's medallion. Each guest's profile is tied to a security picture, so a crew member can compare a passenger's photo on a portable device. It also says the medallion doesn't contain sensitive information such as the stateroom number, much like a hotel room key. The company added that the system features additional authentication, although it declined to elaborate. Donald said the technology could be adapted for other industries, too. Imagine a patient entering the hospital and being recognized immediately by a nurse without having to check in or fill out forms.